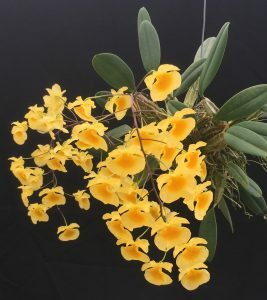 This stunning little dendrobium species was hanging above our laminar flow cabinet at London and thankfully made it back to the greenhouse in good condition. 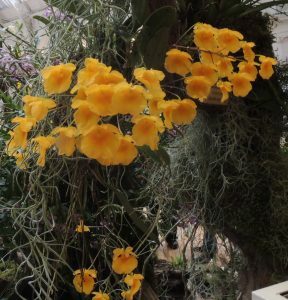 Dendrobium lindleyi is a compact species that produces masses for relatively large flowers in early summer. This plant was deflasked in 2010 and produces a great display every year. The species is found over a wide range from Assam through South East Asia and we have seen it growing in Loas near Luang Prabang near the Mekong river at around 700m growing in seasonally dry evergreen forest with the species most common in the lower branches of big semi-deciduous trees near the river. Like other members of Dendobium section densiflorum (the species densiflorum, thyrsiflorum and Jenkinsii) we find the species does best with a warm wet summer in Warm Asia and then a dryish cooler winter and for Dendrobium lindleyi we find it enjoys the roof of our Cool Americas section.